Personal debt, a term similar to consumer debt, is used in economics to denote the outstanding debt of consumers as opposed to businesses of governments. Unlike public and business debt, personal debt is amassed primarily through consumption rather than investment. It includes debts incurred through the purchase of goods that do not appreciate value and are consumable. Debt held by the U.S. public has dramatically risen since 2008, but is set to stabilize from 2018 until 2028. Many economists advocate the power of personal debt to fuel economic expansion. With the availability of cheap credit and increased demand for consumer goods, consumers can help to increase domestic production and economic growth. However, as the household debt ratio to GDP in the United States shows, talking in macroeconomic terms creates distance to the personal tragedies that result from excessive debt, often having their beginnings in high debt payment to income ratio. 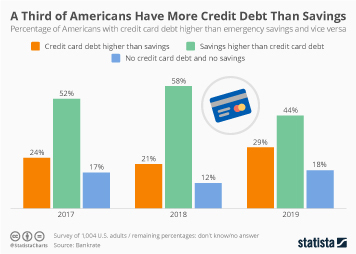 There are various sources of debt in the United States, but mortgages and credit card debt were the predominant sources in 2018. Credit card debt is one of the worst types of debt due to the high interest rates, which makes it harder to pay off. However, only 36.4 percent of Americans completely paid off their credit card balance every month in 2017. Total amount of student loans in the U.S.